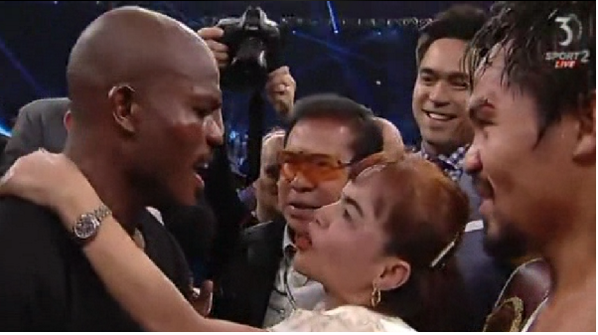 Manny “Pacman” Pacquiao won by unanimous decision over Timothy Bradley but his mom Dionesia Pacquiao who is sitting in the ringside steals more of the show. Mommy D as fondly called by many has caught by the cam on round 6 like she was praying with some weird act as if she is throwing a f*ck finger on the cam. 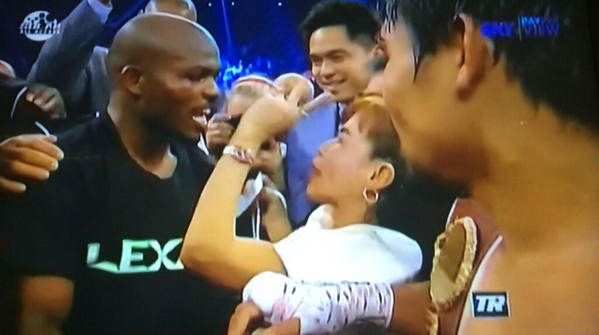 The commentators said she might be chanting some Filipino curse to Bradley. Mommy D without her knowing became a trend in twitter worldwide. She also seen at the ring after the fight is over which is not usually her way in Manny’s previous fight, she also caught talking and hugging Bradley after checking his son. Mommy D is now talk of the social media, she even been features at the usatoday.com as the “starof the night”. And before this, Mommy D took time to prayed over to Manny in his room, this proves only how loving, caring and protective mom is what Mommy D to Manny. Hat’s off to Mommy D although I admit you amuse me a lot on this fight. hahaha! i didn't catch it on tv.. it looks like a novena book, but it didn't seem like she's doing a novena, hehe! hahaha! i didn't catch it on tv... it looks like a novena book, but she didn't seem like doing a novena, hehe!